The three pillars of sustainability are Social, Economic and Environmental. 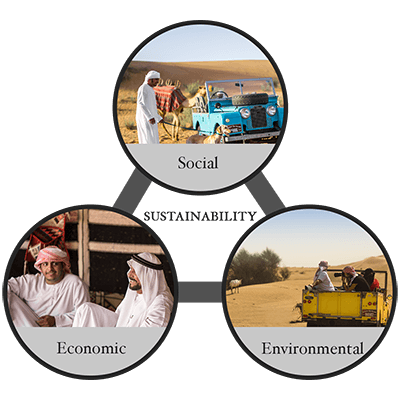 Platinum Heritage’s Sustainable Business Mission has a holistic view of sustainability and embraces all three pillars. We have successfully implemented robust environmental, social and economic strategies which support our mission to preserve the cultural heritage, local industry and native fauna and flora in Dubai. So much so that we are the first and only desert safari company to be awarded the coveted Green Tourism Award by Dubai Tourism for all our efforts. 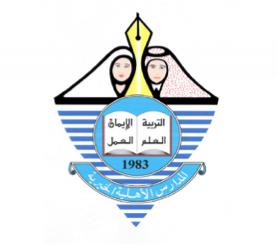 After winning the Gulf Sustainability & CSR Award in 2018 for the Best Sustainability Education Programme, a case study about our sustainable efforts was created. You can download it here. None of our Desert Safaris include dune bashing as it is very damaging for the desert; instead we offer wildlife drives through the Dubai Desert Conservation Reserve. Numerous studies have highlighted the devastating effects of dune bashing on the environment. This is the leading cause to severe desertification which is a terrible environment degradation where vegetation and wildlife is lost. We have made it our responsibility to educate guests and the industry about the damage of dune bashing. 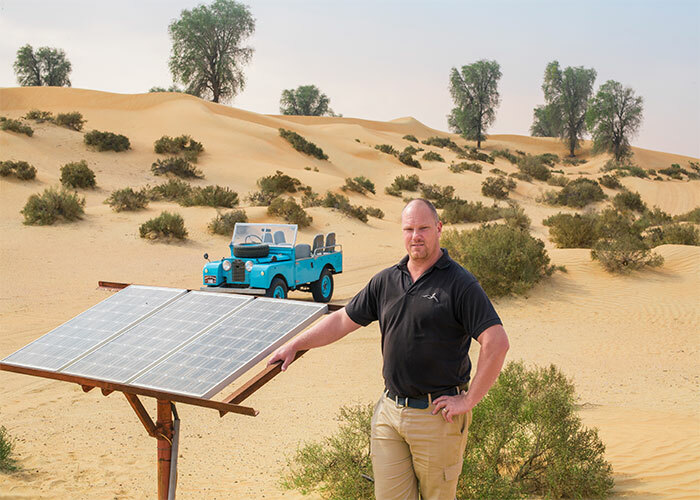 Platinum Heritage is the only company in the safari industry to do something about educating the industry, protecting the desert environment and removing dune bashing from their desert experiences. No company can truly call themselves “Green” when they participate in a daily activity that is leading animals and plants towards extinction. Our wildlife drives are lead by our professional Safari Guides who share snippets of interesting stories and facts about the local fauna and flora and conservation efforts in the UAE. Since the inception of Platinum Heritage, we decided not to use a generator or city power. We undertook a multi-strategy approach to embrace the use of renewable energy to run our tours. Step 1: Design the camps using gravity to reduce energy requirements for example, we elevated our water tanks, removing the need for a pump to move water around. Step 2: Research and use low energy equipment such as refrigerators. Step 3: Install LED lights that require a much lower demand for power. Step 4: Install solar panels and batteries to provide solar power for 100% of our energy requirements. When it comes to calculating a vehicles environmental impact, fuel efficiency is only one part of the equation. It has been estimated that around 30-40% of the total greenhouse gas emissions over the life of a vehicle come from its manufacture (up to 60% for a hybrid). Scrapping creates large quantities of non-recyclable plastics, toxic heavy metals, asbestos, CFCs, PCBs and rubber products, all of which have to be disposed of. Since driving a Toyota Prius through the desert isn’t a feasible option, we have no option but to choose a more functional vehicle which uses more fuel. Despite this, we have found another way to reduce our environmental impact through rebuilding old vehicles. We have the largest fleet of active museum-quality series 1 Land Rovers in the world. Keeping an old vehicle on the road instead of scrapping it and buying another one is a more eco-friendly option. Landcruisers and Hummers which are usually used for desert safaris need to be replaced every 5 years in Dubai. This means that our growing fleet of 21 vintage Land Rovers have already saved 18 vehicles each from production and scrap and 270 vehicles collectively. Since these vehicles were built to last, there is also a huge demand for second-hand parts, saving these parts from being scrapped and melted down, avoiding yet more environmental damage. In 2017 we switched from plastic bottles to stainless steel reusable bottles. 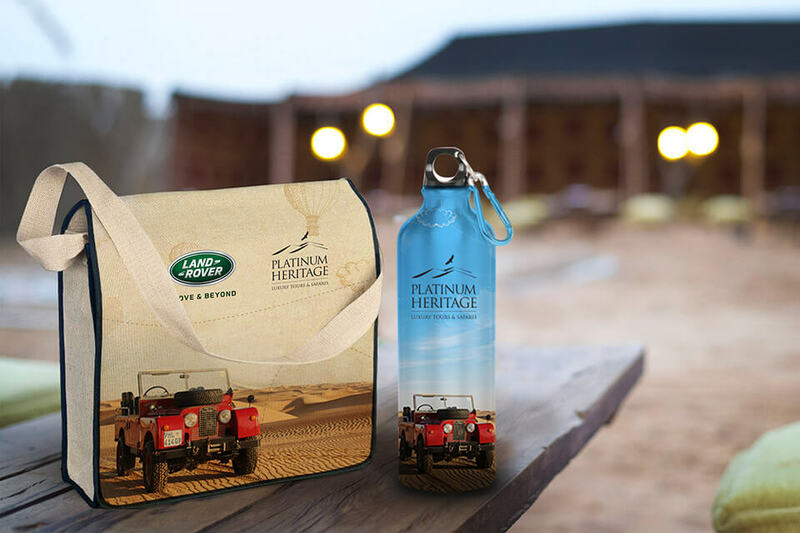 Not only is this more environmentally-friendly (the camels will thank you), you get a souvenir to take home after your desert safari experience. This switch is saving 160,000 plastic water bottles per year. You can read more about our reusable bottle initiative on our blog. 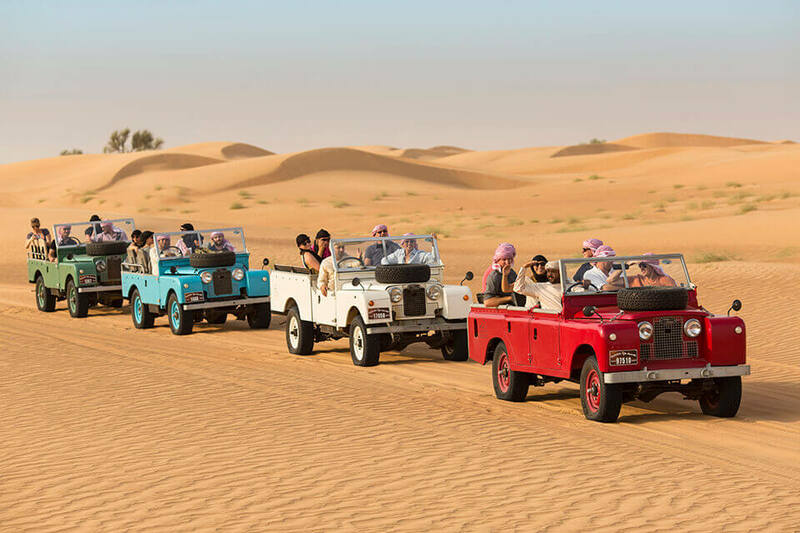 As Dubai’s leading Desert Safari company, we strive to preserve the cultural heritage of the UAE by educating and introducing tourists from around the world to the true heritage of Dubai. This is why we create authentic travel experiences which simultaneously preserve local culture and support the economy of the local community. On all our tours Guests take a step back in time and experience what Dubai was like 50 years ago. We introduce them to the Bedouin way of life and give them the opportunity to learn about the rich traditions of the ‘desert dwellers’. The Bedouin Life, Falconry and Wildlife Drive in particular gives guests the chance to meet and chat with Bedouin storytellers, pet farm animals, get up close with the Arabian hunting dogs called Saluki’s and learn about Bedouin-style hunting. It is not easy to find authentic cultural representations in Dubai. Our educational programs have engaged over 150,000 overseas tourists, local residents, local companies and school students all of whom have donated towards desert conservation and encouraged the display, employment and protection of the Emirati people and their customs and traditions. The Platinum Heritage YouTube Channel has reached over 2, 621, 755 worldwide and our Dubai Heritage and Dubai Desert Conservation playlists are a series of videos focused on educating the world about the cultural heritage and conservation in Dubai. Our success means that thousands of school children, tourists and local residents have a deeper understanding of local traditions and customs and have discovered that there is an abundance of life inside the desert that needs to be protected. At the Gulf Sustainability and CSR Awards earlier this year we were awarded the Best Sustainability Education Programme. 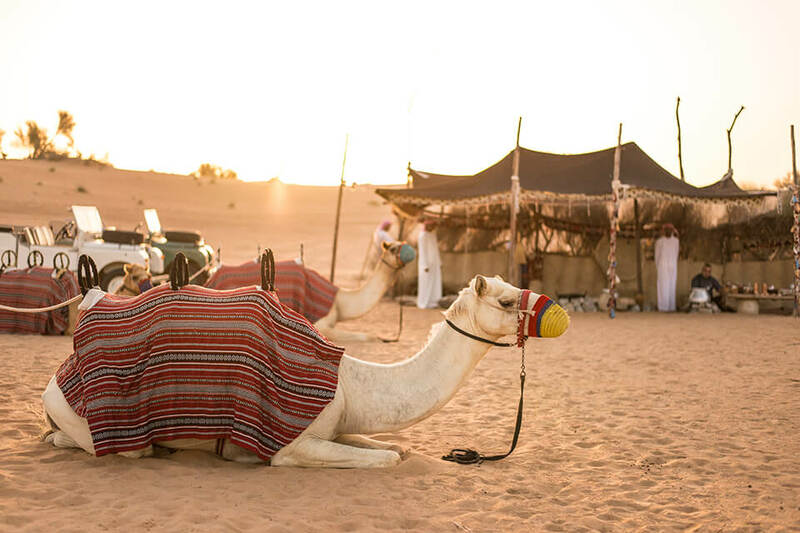 Unlike most desert safari companies, we have replaced the environmentally damaging practice of dune bashing with a desert wildlife drive which showcases the Bedouin people’s connection to the land. 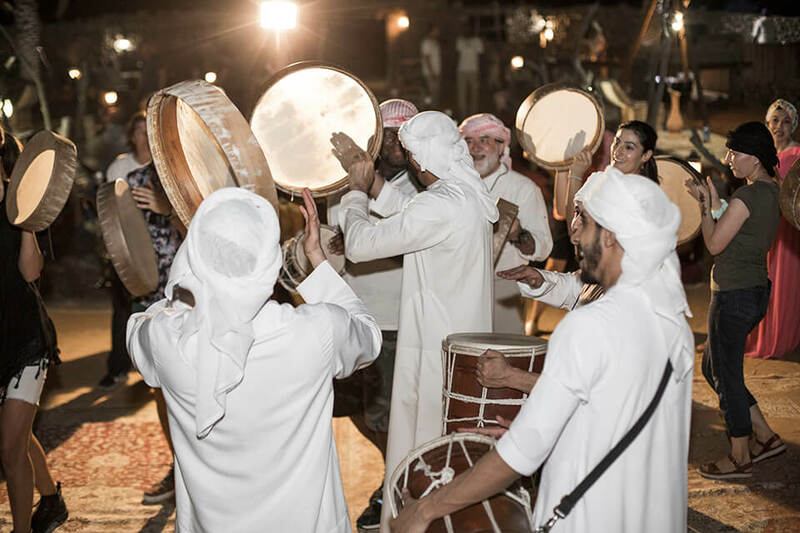 We have removed false cultural references such as Belly dancing and Tanura dancing (both from Egypt) and replaced them with two cultural dance performances, alcohol (which is haram or forbidden in the local religion) and international cuisine and replaced it with authentic Bedouin cuisine. 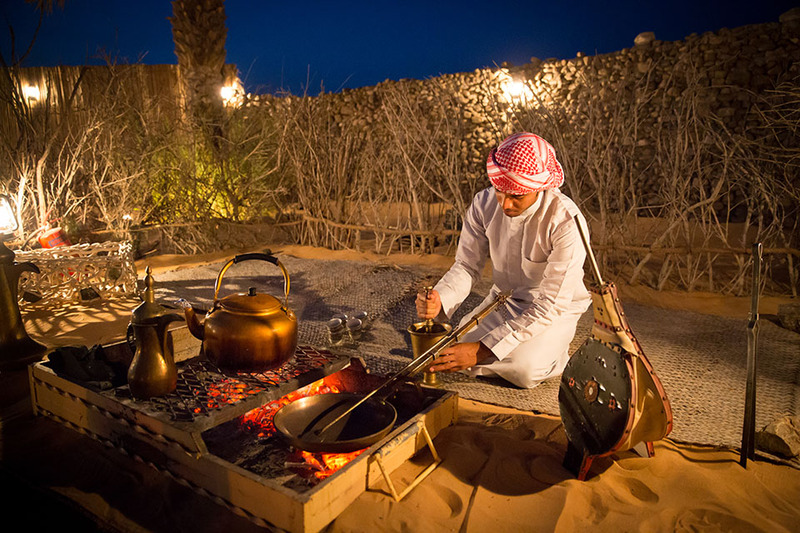 Our tours educate the local and international market about the true elements of Emirati culture such as the use of saluki dogs, poetry, dance and song. The heritage and culture of Dubai’s past is slowly being lost so it is of paramount importance to preserve it. We employ local community members who are caught in a political loophole. Basically, they are people born in the mountain areas of the UAE and do not hold citizenship or a passport to any nation. They have applied for Emirati citizenship but there are strict requirements that these mountain Bedouin cannot always comply with. This makes them difficult to employ based on their non-existent visa status. We employ three of these community members as a Bedouin bread maker, henna artist and coffee maker. We employ Emirati students to conduct the entertainment for our Guests which helps them pay their way through University. We also only procure locally produced vegetables where possible. All too often it is assumed the locally community doesn’t need this help and they are not aware of the plight of a few. 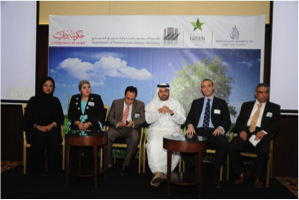 Platinum Heritage was the only representative in the UAE to participate in World Responsible Tourism Day. Started by the United Nations, this day focusses on highlighting the importance tourism operators can play in promoting social, environmental and cultural issues. Platinum Heritage hosted 150 students who conducted a desert clean up session and also learnt about desert conservation, animal welfare and Emirati cuisine and Bedouin life. 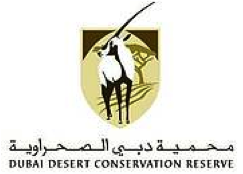 The Dubai Desert Conservation Reserve is the largest conservation project in the UAE. In order to assist the conservationists with their important work, we donate proceeds from each guest. 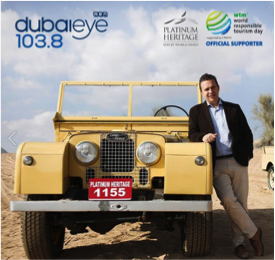 Appearing on the UAE’s most popular talk back radio station, our Managing Director, takes the chance to speak about desert conservation and what tour companies and the general public can do to help with the protection of the desert eco-system. ”About 95% of the animals in the desert live under the desert sand so you don’t see it. So a lot of people because they can’t see it they don’t think it’s there and it’s really sad. So we’re trying to educate the market that dune bashing isn’t this innocent thing, it’s an adventure sport and it should be limited to certain areas because it does a lot of damage”. As a guest speaker for DTCM, our Managing Director has participated over the last few years in talks about “Sustainable Tourism” speaking about the elements to consider in order to run a responsible business. Educating Hoteliers and Tourism Companies about preserving the culture, supporting local communities and contributing towards desert conservation. 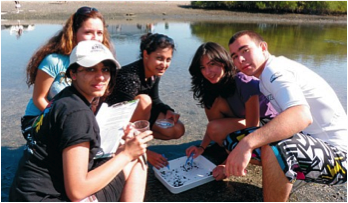 Understanding that children are the future leaders of our environment and cultural future, we have designed a series of nature-based programs such as; Desert Conservation, Conservation Nature Walks, Wildlife Driving and Astronomy. 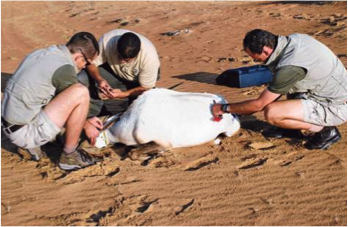 Each of our in-house Safari Guides go through an intense and comprehensive training course conducted by our own Conservationist with over 10 years’ experience in the fauna and flora of the UAE. Guides undergo refresher training as required and are evaluated regularly to ensure high standards. This is to ensure that our Guests have the best possible experience. 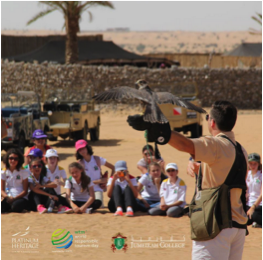 In partnership with Dubai Cares, Platinum Heritage conducts environmental and cultural safaris free of charge to the National Charity School in Garhoud. These disadvantaged students do not have the financial means to participate in external field trips but Platinum Heritage extends this service so all students benefit from the knowledge shared about Bedouin culture and desert conservation. 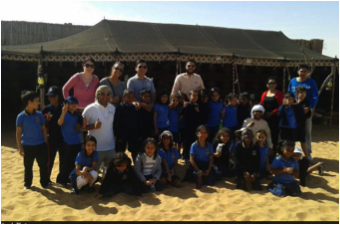 Platinum Heritage providers Teachers working in disadvantaged schools with free field training in the areas of desert conservation, Bedouin life, animal and plant species, Astronomy and Emirati cuisine and entertainment. We feel that the knowledge gained by these Teachers will trickle down to thousands of students.